Sonya Castro-Quirino has returned to Texas Tech University Health Sciences Center after earning her bachelor’s degree there years ago. Now, she has the compliance experience to take the university to the next level. Sonya Castro-Quirino knew she wanted to be involved in the health field from a young age. Raised by a single mother who worked her way through nursing school at Texas Tech University Health Sciences Center (TTUHSC), Castro-Quirino says her mom would take classes and read to her from her textbooks. “These were my bedtime stories,” she says. Today, Castro-Quirino is the assistant vice president for compliance at TTUHSC. There, she leads a team of nine people and oversees compliance efforts for the institution’s Lubbock, Amarillo, Midland-Odessa, Abilene, and Dallas campuses, which serve 108 counties. It also happens to be where she went to school. Between her studies and her job there, she picked up significant compliance experience that she brings to her current position. Castro-Quirino’s career could have gone in a vastly different direction. She graduated from TTUHSC with her bachelor’s degree in clinical laboratory science and worked in a lab after graduation. She knew she wanted to either move up in a lab or work in healthcare administration. Ultimately, she decided to get her MBA at TTUHSC, with a concentration in health organization management. It was during this time that she first immersed herself in the world of compliance. While in graduate school, Castro-Quirino interned for the hospital’s chief financial officer. She was tasked with the responsibility of figuring out what the office should do from a compliance perspective. Compliance was still a relatively new field and the resources were scarce, but Castro-Quirino immersed herself and did everything she could to learn about the field. The work paid off when she was hired by the hospital after graduation. She eventually landed a job as an analyst with the Office of Inspector General (OIG) in Washington, DC. 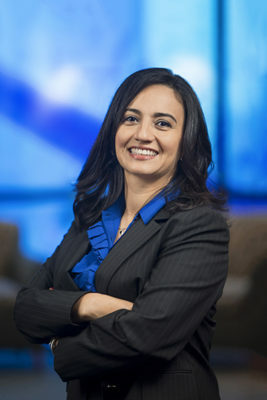 Castro-Quirino had always lived close to her family and worked in clinical settings, so the move prompted some serious professional and personal growth. “I did see that as a turning point,” she says. Her government work has proved to be an invaluable resource in her career. “I know how they think and how they conduct investigations, so that opened up a lot of doors for me,” she says. The next door it opened for her was another major opportunity, one that coincided with her personal life. She moved with her then fiancé—and now husband—to Arkansas, and around that time, the OIG was entering into an agreement with Wal-Mart’s pharmacy division. Wal-Mart’s general counsel gave her a call. The company’s audit department didn’t have anyone with healthcare compliance experience, and Castro-Quirino fit the bill perfectly. She was brought in to lead the healthcare audit group, and under her guidance, the department started developing audits to make sure Wal-Mart was complying with the OIG’s agreement. Castro-Quirino and her team traveled extensively to audit compliance practices in Wal-Mart pharmacies throughout the United States and Puerto Rico. After a year, she became the compliance officer for Wal-Mart’s pharmacy division. Wal-Mart and TTUHSC are two vastly different institutions, but when Castro-Quirino arrived at the latter, she found a lot of similarities, at least when it came to compliance. “The compliance issues, the training we provide, and the reception that we get to what we have to do and what the right thing is to do are very similar,” she says. Castro-Quirino also notes that compliance efforts are not just the work of one office. While her compliance team provides guidance and training, she sees it as everyone’s responsibility. She and her team encourage everyone at TTUHSC to speak up and report issues when something isn’t right. “That’s the only way you can have an effective compliance program,” she says. When it comes to her leadership style, Castro-Quirino believes in letting individuals do what they do best and pursue their specific interests. “There are certainly people in the department who have niches and expertise in certain areas, whether it’s coding or privacy or security, and I really rely on them to be our subject-matter experts and let them grow in that way,” she says. Looking ahead, Castro-Quirino wants to help her alma mater fulfill its mission as a healthcare provider and institution of higher education. She will also continue to develop her team to proactively monitor the school’s compliance activities to ensure it is prepared to respond in a timely manner, should issues arise.